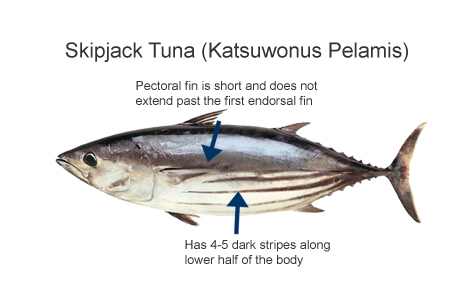 More Detailed Description: Skipjack Tunas are distinguished by the presence of four to seven dark, longitudinal stripes on their bellies. Their dark blue backs are accentuated by a clearly defined area of green above the pectoral fin, which fades away towards the middle of the body. They have silvery flanks and bellies and short fins. (These subheadings do not cover the Atlantic or belted bonitos (Sarda sarda), which have oblique bands on their backs. Skipjack is the most popular tuna for consumption. It prefers to swim in the upper mixed layers of the ocean water, and mostly found between 45o N and 40o S. It is highly migratory and can be found all over the world within tropical waters. Large schools sometimes mix with small yellowfin. Normally dolphins do not swim together with the small skipjack, which almost makes it a guaranteed dolphin-safe species. Product characteristics: The meat of the skipjack has a somewhat darker of color sometimes even slightly pinkish. It has a relatively tender texture, and is has somewhat more a fishy taste then some other tuna species. The small size of the fish gives small loins and chunks. Making it excellent for canned tuna chunks. Future Supply: The scientific assessment of the skipjack stock is that all catching areas are moderately exploited. In some areas such as the Indian Ocean there is an occurrence of full exploitation. The skipjack tuna is an epipelagic fish, occurs in seawaters ranging in temperature from 14.7 to 30°C. While skipjack tuna are known to remain at the surface during the day, and at night they may descend to depths up to 850 feet (260 m). Skipjacks have a tendency to school and exhibit many types of schooling behavior; they have been observed schooling with drifting objects, sharks, or whales. These schools may consist only of skipjack, or sometimes multiple tuna species are present, and they may swim slowly in circular paths or travel in a single direction. Skipjack are often divided into schools based upon their size. This may be due to the smaller fish being unable to maintain the same top speeds of larger fish, and smaller fish may feed in schools, whereas larger fish (20 cm or longer) tend to feed alone. The skipjack tuna have an elongate fusiform body, a typical tuna fish shape. They possess two dorsal fins, of which the first one consists of 14-16 spines. The second dorsal fin is directly behind the first one with a small space separating them, and is followed by 7 to 8 finlets. The pectoral fins are short compared to others and consist of 26 or 27 rays. Skipjacks are practically scaleless tuna species, except along the lateral line and the corselet. Using their dark purplish-blue dorsal, Skipjack tuna camouflage themselves by maintaining a silvery hue both laterally and ventrally from predators below. There are also 4 to 6 dark bands running along the sides of the fish extending to the tail, which in live fish it may appear as a discontinuous line of dark blotches. Their teeth are small and conically shaped, and they are lacking a swim bladder. The upper body is dark blue or purplish colored, while their belly and lower sides are silvery and they have 4 to 6 dark but broken lines running across the length of the body. These stripes running along the belly distinguish this tuna from other scrombridae species living in the same waters. The maximum length of a Skipjack tuna is about 108 cm fork-length with a maximum weight of 32.5 to 34.5 kg. However, a more common size is 80 cm fork-length and 8 to 10 kg in weight. The populations of skipjack tuna in the Atlantic Ocean have appeared to be declining in recent years while populations in the Pacific Ocean appear to be stable. At this moment, the skipjack tuna is not listed as threatened or endangered in the World Conservation Union (IUCN) Redlist, and is considered to be in no immediate threat.